Ice makers have become an essential part of standard kitchens for several decades now. Gone are the days people would have to buy bags of ice from the store or invest in ice cube trays that take up valuable space in our freezers. Automatic ice makers such as the Whirlpool ice maker take the stress and guesswork out of making ice and ensure that we have ice whenever we need it. With an ice maker like the Whirlpool ice maker, you will find you do not have to even think about ice at all. We know you are eager to start learning about ice makers and the amazing Whirlpool models, and so are we. Let's jump right in to look at our review of the products so you can get started enjoying your new ice maker. How Do Whirlpool Ice Makers Work? Remember the old days when you had to purchase molds for ice, fill them with water, and allow them to take up valuable fridge space? The process of filling molds with water and freezing them has not changed but has now become automated, so you do not have to do any work. Once the ice maker has been connected to a power and water source, it begins automatically. At the beginning of the cycle, an electrical signal is sent to a water valve to fill the ice mold with water. The freezer then freezes the water, and a signal is sent to halt that process when an internal thermostat indicates the cubes have reached 5 to 9 degrees Fahrenheit. After the cubes have been created, a heating coil is then activated to loosen them from the molds. The ice maker's ejector blades are then used to push them out of the molds, and they are funneled into the collection tray. A shaft separates the tray from the dispenser at the front of the unit which is opened when the lever is pushed down. This cycle will continue indefinitely until the shut-off arm installed at the front of the maker sends a signal that the ice cubes are stacked to its capacity. Since the process of making ice through an automated ice maker is so complicated, there can be a number of reasons why your ice maker is not working properly. There are several common reasons with some fixes being simpler than others. It's possible the ice maker shut-off arm is defective or has been turned off accidentally. A faulty ice maker thermostat could also be a culprit as the water valve will not be released if the temperature is not in its proper range. A more complex issue could involve the ice maker motor that sets the whole cycle into motion. Other common reasons your ice maker may not be working include: insufficient water pressure from your home plumbing line, the overall freezer temperature is running too high to make ice, the water filter needs to be replaced (though higher-end models will alert you of this), there are frozen or clogged fill tubes, the thermostat is faulty, the water valve is faulty or clogged, or the motor is faulty which would mess up the whole maker cycle. Whirlpool ice maker machines fit easily under the counter or in your kitchen, and they make up to 25 pounds of ice. They are a great choice for large families or those who entertain often. They also offer small ice makers for your refrigerator to automatically refill when you get low and keep your supply fresh and right on hand in your fridge. There is a full line of Whirlpool ice makers to choose from for your home to find the right fit for your needs. The Whirlpool brand advances technology to the point of simplicity, creating innovation that's forward thinking for what they choose to put it in. They offer great designs that fit seamlessly into life. The Whirlpool brand promises to create cleaner, more flavorful, and more efficient homes with their products and they set higher standards with their advanced performance. They offer great results while using less water and energy. Their appliances are Energy Star qualified and delivered eco-efficient operation that exceeds the toughest government standards. "Give us your messes, your time constraints, your summer barbeques, and your last-minute dinner plans, and we'll give you peace of mind. Whether you need a home appliance to replace a washer and dryer, a new refrigerator, or dishwasher to meet the needs of your growing family or a full set of household appliances for your kitchen remodel, you'll find reliable products that provide top-of-the-line care for your clothing, food, and home. Browse online at www.whirlpool.com to learn more about the ways our home appliances help you care for your family every day. Then find a retailer near you and bring us home today." This guarantee ensures that when you shop with Whirlpool, you can rest assured you're getting the best quality home appliances money can buy. As with most consumer products, the price of ice makers will vary greatly depending on what the customer is willing to pay. For our Whirlpool ice maker review, we chose the most affordable model that offers the most value for the money and is an excellent choice for our budget-conscious readers. 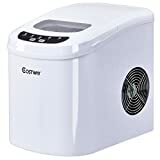 The Whirlpool model costs about $53 on Amazon, the YONGTONG model costs about $109, the Costway model costs about $115, and the Northair model costs about $135. This replacement part will fit your Whirlpool refrigerator and freezer perfectly. It's affordable, easy to install, and comes with an 8 cavity crescent cub. It's one of the best-loved and revered replacements on the market and features a modular style replacement. Although it does not come with the bail and the motor cover, installation involves simply removing three screws, swapping your current lever out. Plugging the new unit in after you unplug the old one, reinstall with the three screws, reinstall the front cover of your old unit, wait a few hours, and the unit will automatically make ice for you. This efficient ice maker makes batches of ice cubes in about six minutes. It produces up to 26 pounds of bullet-shaped ice per day. It has a sleek performance-oriented design, is extremely portable and easy to take with you, and has a removable tray for an easy ice transfer. It comes equipped with modern compressor refrigeration technology and has a see-through window on the top to allow for process monitoring and ice level checking. It's easy to use and requires no plumbing or professional set-up. Simply plug it into the main power source and add water! It's convenient and has a compact design that allows it to be placed anywhere. 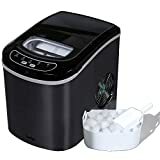 It makes ice cubes in less time than it takes to run to the store to grab ice, and this one does not charge you for making ice. 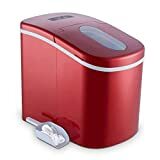 This portable and compactly designed ice maker machine makes it possible to work anywhere such as a party, a gathering, in an RV, a boat, or a kitchen. It features a modern chic design that allows you to be able to see through the window for process monitoring and ice level checking. It has a stylish design and is available in four different colors to suit your needs. It can continue to with without interruption for 24 hours, and it's able to make up to 26 pounds of ice in that time. With 1.5 pounds capacity in the ice cube basket, you can make plenty of ice ahead of time to have on hand. You can create ready-to-serve ice in an average of about 8 minutes. It has a light indicator that alerts you when the water level in the reservoir runs low. When the ice bucket is full, you will be alerted to remove them so more ice can be made. The control panel is easy to understand user-friendly, and easy to use as it has a visible function touch display setting. This portable and compact ice maker unit is perfect for parties, RVs, camping vacations, and boat trips. It is wrapped in commercial-grade stainless steel which is available in four different colors. It can make up to 26.5 pounds of small or large bullet-shaped ice cubes per day and efficiently makes ice in as little as 6 minutes. The included indicator lights let you know when the ice basket is full and when you need to add more water. Any unused ice will melt back into the reservoir and be recycled into fresh water for a waste-free operation. We hope our review of the Whirlpool ice maker has given you a great model choice for your next ice maker. If you are looking for a reliable ice maker that has easy installation, a compact size, and fits in your Whirlpool fridge and freezer, look no further. If you are considering whether or not to go with the Whirlpool brand, read the Whirlpool guarantee and rest assured you are making an excellent choice going with a brand that stands behind its products and will be there for you when you need them. Follow the Amazon link to the Whirlpool ice maker (or any of our other reviewed items) and purchase them for yourself or read up on more information and customer reviews. What are you waiting for?